Ever tried to do homework with a candle? After many years of suffering from difficult and discouraging circumstances, these children now have better lights now: a solar charged study light. 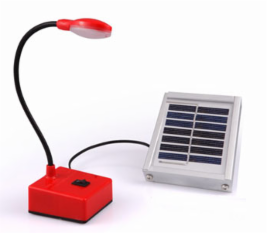 The lamps are especially designed for the rough conditions in rural villages. One charge of the battery lasts for about 10 hrs of bright light, enabling a child to study properly and in comfort (as compared to dim kerosene lamps or faulty power supply with black-outs as in many Indian cities). The lights have different options for charging, like a Nokia mobile phone charger wherever grid electricity is available. However, the preferred option is the classroom installation of a solar bulk charger for up to ten lamps, operated by a trained Solar Technician who can also ensure maintenance and small repairs. The study lamps are appropriate technology with in-build high-tech, like driver electronics with 42 parts maximising the light output with one battery charge. Nevertheless, one lamp costs less than 5 US-Dollar. Although the technology is available and proven, it is not yet reaching where it is needed most. What we provide is exposure and financing to kick-start a development process in rural areas. We are working with local NGOs that are well established in the region and have a proven track record of people-centred participatory development. Our partner NGOs are selecting suitable villages and introduce the idea there. Once the village assembly makes a commitment, a community member is trained as a solar technician. We provide the funds to acquire the necessary equipment and solar panels, and a Solar Energy Kiosk is started. People can get a lamp there when they pay a rental fee or a down payment, and they contribute for every charge, too. The money collected ensures the sustainability of the project – the salary for the technician, spare parts and replacements etc. All the funds remain under the control of the community who can use it for their community development. Therefore, the solar lamps do not only solve the lighting problem, but bring about development for the full village.